"The prayers of the saints in heaven assist the faithful on according to the Revelation of St. John (5:8 and 8:3-4 in the light of 6:9-11). Therefore, while the saints are not to be given worship or adoration, which is due to God alone, or to be invoked in a manner that implies such worship or adoration, their prayers are a part of the communion of the saints confessed in the Apostles' Creed. The prayers of the saints in heaven support Christians on earth, just as Christians on earth support one another in prayer. For this reason all Catholic and Orthodox Christians believe that Christians may ask for or invoke the prayers of the saints. Such requests for prayers occur in the formal worship of the Anglican Catholic Church and are an important part of the relationships of prayer and love which knit together the ages in the communion of the Church." The word SAINT means 'holy one', and so the saints are God's holy people. In the broadest sense, all members of the Church are, potentially at least, 'saints'. St. Paul uses the word in this way in his letters, but it wasn't long before the word came to have a more specific meaning. Very early in the life of the Church it came to be recognized that certain individuals lived more obviously 'holy' lives, or were specially favored by God. Chief among them were those who had died for the Faith - the marytrs, and supremely, the Mother of God herself. As time passed the Church began to realize that holiness only sometimes went hand-in-hand with martyrdom. More often than not holiness was apparent in other, less dramatic ways. Often, though, it was only recognized after the Saint's death. "I believe in the Communion of Saints"
Members of the Anglican Catholic Church say these words at the Offices of Morning and Evening Prayer; they are part of the Apostles' Creed. They remind us that the Church is much bigger than our own congregation, or even the entire 'Church Militant' here on earth. They remind us that the larger part of the Church exists on the other side of the grave, the Church Expectant and the Church Triumphant. The whole Church, living and departed, is united in the one eternal Eucharist. We are united to Christ by Baptism and by eating His Body and Blood in the Eucharist, and so we are intimately united to each other. The Church Expectant consists of those Christians who have died, but who because of their need for preparation, are unable yet to enjoy the full presence of God. 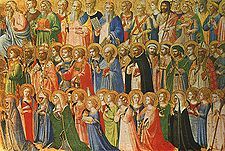 We pray for those souls in the belief that our prayers, together with those of the Saints in heaven, will hasten and ease their passage. As 2 Maccabees 2:44-45 puts it, "pray for the dead (will) ...free the dead from their sin. The Church Triumphant is the Church in 'heaven'. The souls of those Christians who are enjoying, to the full, the Heavenly Banquet. The Book of Revelation, paints a picture of the glory of heaven and the fulfilment of the Saints. It also reminds us that the Saints in heaven continue to offer prayer to God. Praying for the needs of other people, for ourselves, is one of the four basic ways of praying. It is called SUPPLICATION. We pray for ourselves, in the belief that whatever we ask in the name of Christ, God will give us. We must always remember, though, that God already knows our needs, and will provide them without waiting to be asked. Praying for others, in particular, is one of the ways in which we demonstrate our care for them. We also ask other people to pray for us. Prayer for each other is the basic expression of Christian love. God wants us to pray in this way, not because he will only give us what we need if we ask for it, but because prayer is good for us! It helps us to be aware of God's love for us; it helps us to be aware of the needs of others, and teaches us to love them; and above all it keeps us aware of our total dependance upon Him. The most important reason is that God wants us to! When we ask the Saints to pray for us we are doing no more than God's will. In their lives, many of the Saints were able, by their prayers, to bring about spectacular works of healing and other 'miracles'. Most of them, though, demonstrated that they were friends with God in more mundane ways. Their ability to do marvelous works was not their own, but came from God. It was God's way of blessing us through them, and His way of showing us that He was honoring them, not as honor they deserved, but nonetheless God's will. The same is just as true after a Saint has died. One of the proofs required by the Church that God wishes to honor a person as a Saint, is that God first honored him/her. As a sign, God grants 'favors' in response to prayers addressed through the Saint. We call these favors 'miracles'. If God gives honor, then who are we to withhold our respect and honor? The second reason is that, just as we believe that prayers of a 'holy' living Christian will help us, so will the prayers of one who is even more alive! If the prayers of we, who are far from being 'holy' and from the throne of Grace, can work miracles, how much more will the prayers of the Saints! Of all the Saints, the queen is St. Mary, the Mother of God. The Gospel according to St. Luke is quite clear. Our Lady as we delight to call her, is of all women the most blessed. She, above all people, is most favored by God who chose her to be the mother of His only-begotten Son, Jesus. Just as Our Lady is the Saint most highly honored by God, so it is right and fitting that she should be the most highly honored by Christ's Church. We are told, if not commanded, in Luke 1:48, that "all generations shall call me blessed." Of all the means of honoring Our Lady, and indeed all the Saints, open to Christians, by far the most fitting is to ask her to pray for us. Asking her to pray for us is not to take anything away from Christ's glory, but to magnify it by doing His will and honoring His Mother. The first recorded example of people asking her prayers is in the Gospel according to St. John (2:1-10), the story of the marriage of Cana in Galilee. St. Luke's Gospel (2:35) shows us that it is indeed God's will that Our Lady will pray for us, and that her prayers will not go unheeded. The prophet Simeon says to Our Lady that "a sword shall pierce through thine own soul, that thoughts out of many hearts may be revealed." Our Lady's prayer for us is that of a mother for her children. When Our Lord was dying on the cross, almost His last act was to commit "the disciple whom He loved" to her maternal care. The beloved disciple's response was to make a place in his home for her. The beloved disciple, who is not named, stands for all Christians, and so it was we who are committed to her care. It should also be the response of al faithful followers of Christ to make a place for His mother in their hearts. Probably the best known prayer to Our Lady, which is easy to memorize, is the Hail Mary: Hail Mary, full of grace, the Lord is with thee. Blessed art thou and the fruit of thy womb Jesus. Holy Mary, Mother of God, pray for us sinners now and at the hour of our death. Amen. Praying for others is a demonstration of our love for each other, and of our faith in God. It is just as important though, to ask other Christians, including the Saints, to pray for us.